Few countries capture the imagination or evoke images of rugged natural beauty as much as the Commonwealth of Australia. Located in the southern hemisphere between the Pacific Ocean and the Indian Ocean, Australia is an island continent of 22 million people. It is one of the oldest continuous democracies in the world, with a political system that is very similar to the popularly elected, two-party system in the United States. Australia is the sixth largest country in the world by land area, and the 52nd largest by population. A vast majority of Australia’s biggest urban centers, including Sydney, Melbourne, Adelaide and its capital Canberra, are concentrated along the country’s east coast. The city of Perth on Australia’s southwestern coast is the only major population center located on the country’s west coast. Australia is a land of spectacular beauty and immense open spaces. Most of the land between Australia’s two coasts is very sparsely populated, and is referred to as the great Australian Outback. The region hosts an incredible diversity of wildlife, including species such as the koala, kangaroo, wombat and the Tasmanian Devil that are only found in Australia. The Outback is also home to dozens of ancient native cultures and tribes, some of which have inhabited the land for several centuries. Australia’s geographic isolation means that much of the flora found in the country is also remarkably different from the flora found in other parts of the world. Some regions of the country host plants and trees that have been around for more than 50 million years. Australia international shipping companies help individuals and businesses transport cars between this vast country and other parts of the world, including North America. 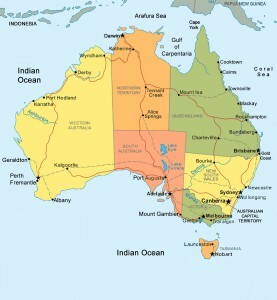 International shipping to Australia can be somewhat time consuming because of the country’s remoteness. Typically, shipping companies take anywhere from three to four weeks to transport a car from the U.S. to Australia. Consumers looking to ship cars between the two countries have the option of transporting their car either in an ocean container, or on board a Roll on Roll off (RoRo) vessel. Containers are, typically, more expensive than the RoRo option. However, shipping companies typically allow individuals to use the extra space in a container to transport items such as household goods. Shipping a car to Australia from the U.S. in a 20-foot container costs between $3,000 to $3,200, and about $4,400 in a 40-foot container. Meanwhile, shipping a car from Australia to the U.S. or the other way around in a RoRo vessel usually costs about $1,600 to $1,800. Shipping to Australia from the U.S. is a relatively straightforward process. Australia has a fairly liberal car-import policy compared to many other countries. Expatriates who are returning to the country permanently are allowed to import their vehicle without paying any excise duty or taxes. Australian citizens who may have purchased a car in the United States or other countries are also permitted to import the vehicle so long as the vehicle meets the country’s safety and emission standards. The excise duty and taxes for such imports vary depending on the make and model year of the vehicle. Cars that were manufactured before 1986 can generally be imported without any duties. Visitors to Australia are allowed to import vehicles duty-free on a temporary basis as long as they export the vehicle when leaving the country.